The RetinAI Advanced Imaging team is aware of the importance of scientific contributions to the field ophthalmology and to healthcare in general. In order to support the transition from reactive medicine to preventive medicine, and to foster the development of solutions to support patient's health and well-being, we are releasing our public peer-reviewed contributions in medical image analysis and machine learning. The automatic segmentation of fluid deposits in OCT imaging enables clinically relevant quantification and monitoring of eye disorders over time. Eyes with late-stage diseases are particularly challenging to segment, as their shape is often highly warped and presents a high variability between different devices, specifications and scanning times. In this context, the RetinAI team proposed a novel fully-Convolutional Neural Network (CNN) architecture which combines dilated residual blocks in an asymmetric U-shape configuration, and can simultaneously segment and classify cysts in pathological eyes. This articles presents a validation of our approach on the Retouch Challenge with the Medical Image Computing and Computer-Assisted Intervention (MICCAI) ’17 Conference dataset. The automatic segmentation of retinal layer structures provides clinically-relevant quantification and monitoring of eye disorders over time in OCT. Eyes with late-stage diseases are particularly challenging to segment, as their shape is highly warped due to the presence of pathological biomarkers. RetinAI has proposed an algorithm which combines dilated residual blocks in an asymmetric U-shape network configuration, and can segment multiple layers of highly pathological eyes in one shot. Our so called BRUnet architecture enables accurate segmentation or retinal layers by modeling the optimization as a supervised regression problem. Using lower computational resources, our strategy achieves superior segmentation performance compared to both state-of-the-art deep learning architectures and other OCT segmentation methods. Visual inspection of Optical Coherence Tomography (OCT) volumes remains the main method for AMD identification, doing so is time consuming as each cross-section within the volume must be inspected individually by the clinician. In much the same way, acquiring ground truth information for each cross-section is expensive and time consuming. In this paper, we present a new strategy towards automatic pathology identification in OCT C-scans. 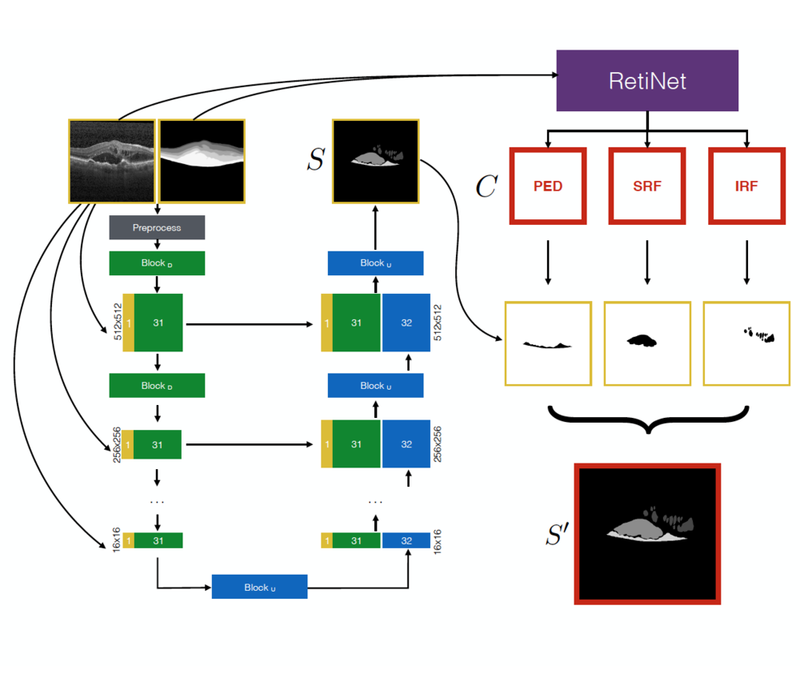 By introducing a novel Convolution Neural Network (CNN) architecture, named RetiNet, that directly estimates the state of a C-scan solely using the image data and without any additional information.